Between April 15 and June 4, 1989, students, intellectuals and activists engaged in a series of demonstrations against the Chinese Communist Party. 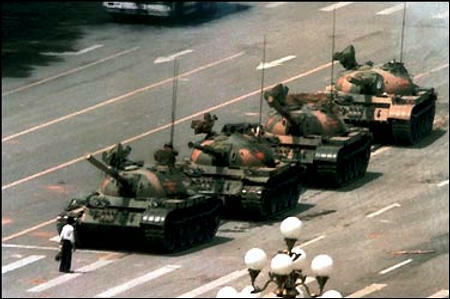 Although the protests took place all over the country, they centered on Tiananmen Square in Beijing, where the subsequent crackdown by authorities caused a vast number of civilian deaths and injuries. According to official PRC figures, the casualty toll was within the range of 200 and 300. Other sources differ, however: Chinese student associations put the number closer to 2,000-3,000. Although the protests of 1989 were not part of a single movement and varied in intensity, they shared a common demand for broader political freedoms. This theme is bound to resonate during the anniversary of the massacre in 2009, as many still make claims for the current Chinese state to ease repression of its citizens.